All the supplies and equipment used in our course are of the very best quality. We use high-grade micro-suture with clinical quality needles, from Ethicon, and we impose no restrictions on the amount used. We use the finest available micro-instruments, from S&T AG, and adjust their tips regularly to an accuracy of .001 of an inch. All imperfect instruments are immediately replaced. 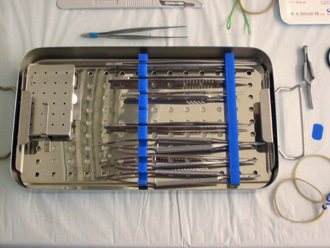 home / Instruction / Microinstruments and Suture top Copyright © International Microsurgery Teaching Course. All rights reserved.